Timber Creek sure didn’t look like the home of Australia’s wildest river OR the crocodile capital of OZ as we pulled in after a punishing hour – and about 90 kilometres – on the road. I hadn’t yet discovered the killer Scenic Loo but even if I had, Timber Creek wouldn’t have looked like dunny heaven either. I checked my watch. Only 10:30 am and we were done with the driving for the day. Damn! How did I turn into a Grey Nomad* without noticing?! 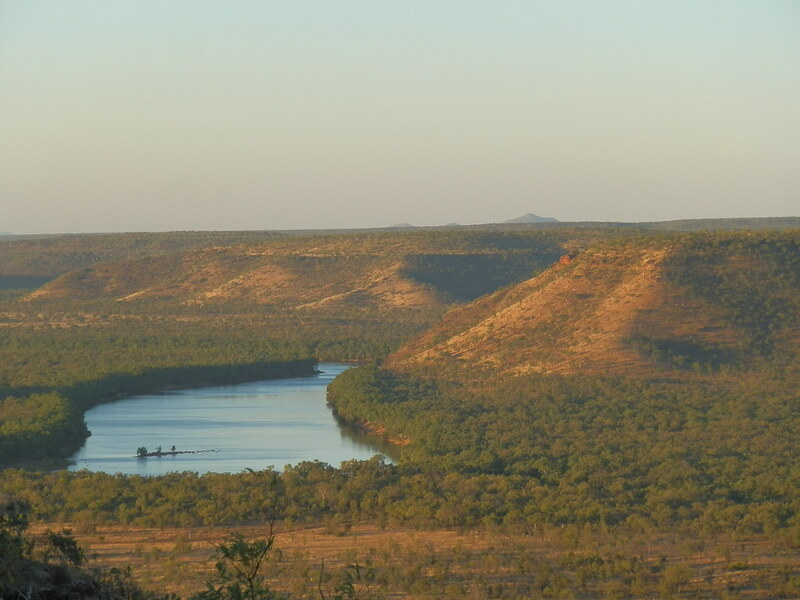 The Victoria River – Australia’s WILDEST – is over 200 km (~120 miles) of sensational scenery, rugged ranges and wall to wall crocodiles. And as well as spectacular natural attractions, the region has an intriguing blend of Indigenous, Colonial and Military history. We’d seen part of the area the day before at the Victoria River Roadhouse. So the bonus of arriving so early meant loads of time to explore the rest. Just as well, because there’s a helluva lot to see! Pilchard and I saw more crocodiles in two days than in all our previous crocodile sightings combined. And when I add all the crocs we’ve seen since then? This town’s still WAY out in front. 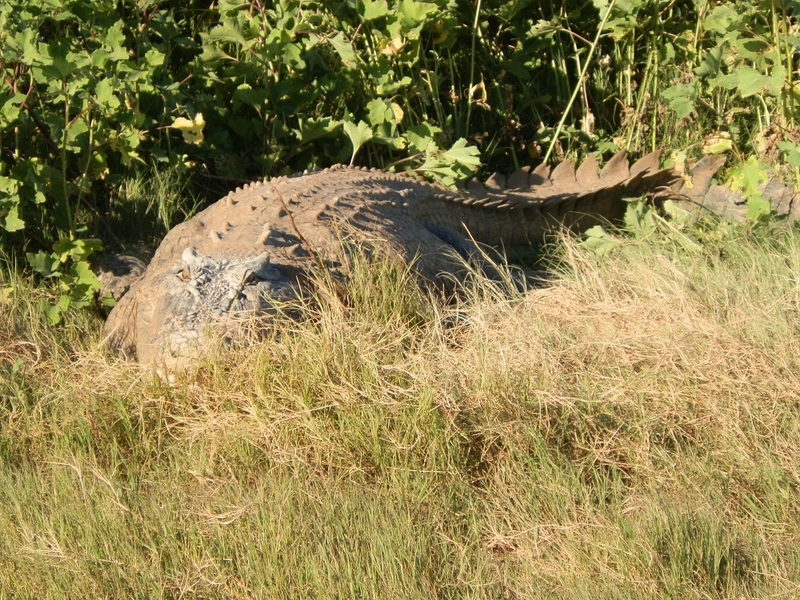 Crocodiles don’t actually go to heaven – they just head north to Timber Creek! Because if you’re a crocodile, what’s NOT to love about Timber Creek? If you’re a freshie**, hang out in the creek behind the caravan park and get fed by a gaggle of tourists EVERY NIGHT! And if you’re a saltie*** the Victoria River is a croc-heaven takeaway with cattle from the stations, wallabies and other wildlife feeding along the banks, and boatloads of barramundi fisherfolk who make catching a big one for dinner REALLY easy! PLEASE NOTE: Practice crocodile safety on and near waterways. All my crocodile photos were taken from a croc-proof boat and pontoon on the Victoria River Crocodile Cruise! There’s something about eating a sensational array of snacks and enjoying a drink while watching a superb sunset sink into a crocodile-infested river. Something that makes you want to – well, YOU know! So where DO you go when nature calls and you’re surrounded by crocodiles on Australia’s wildest river? To one of Australia’s most scenic and unusual toilets, of course! Yes, it’s in MY BOOK (click right HERE to got there)! 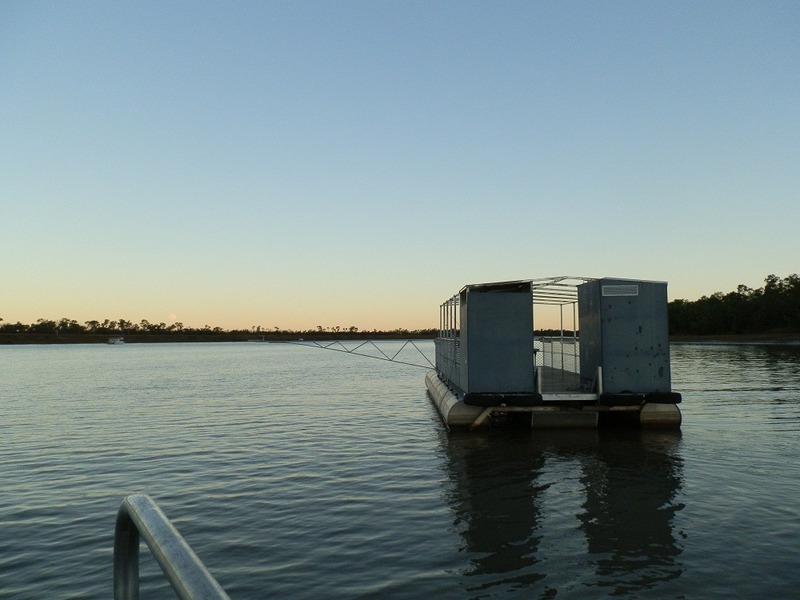 The pontoon potty is just one (VERY good) reason to take the Victoria River Crocodile Cruise. It’s a 3 hour 70 kilometre journey into the heart of the Top End with local guide Neville Fogarty in his purpose built croc proof boat – the Fleetwing – to a pontoon perfectly positioned to showcase the sights. And see as many crocodiles as you’re likely to see anywhere outside a crocodile farm! The Crocodile cruise isn’t just about the crocs. Before we get anywhere near the river, we’ve had a mini-town tour, fascinating history lesson, and a pit stop at the local museum. But the croc cruise gets back after sunset, so we stay another day to see what we’ve missed. 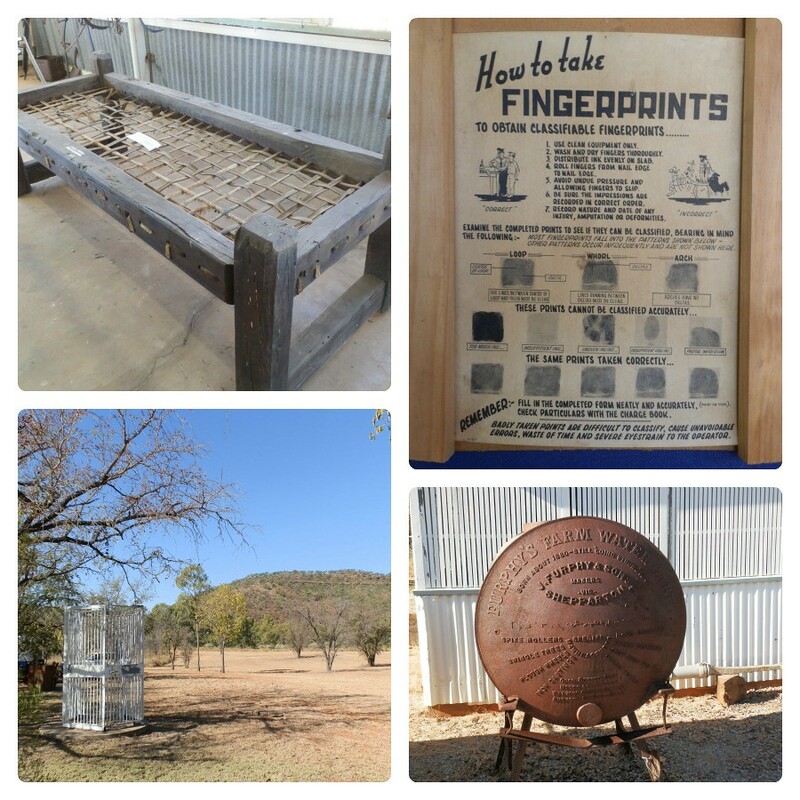 I didn’t know anything about how to take fingerprints correctly until I entered the heritage listed Police Station Museum, also home to other quirky memorabilia like a Furphy; and a kangaroo hide bed where Neville Fogarty (croc tour man) apparently once slept! But reminders of more shameful past episodes are in the shackle and chain for Aboriginal prisoners still attached to a tree, and the holding cell in the front yard. And who knew about the Nackeroos, ‘Bush Commandos’ with a platoon stationed at Timber Creek after the Top End was bombed by the Japanese during World War Two? I certainly didn’t, but the escarpment memorial tells of the hardships faced in defending Australia’s coastline in this wild and remote area, and the great respect for the skills of the local Aboriginal people working with and as part of the Nackeroos. 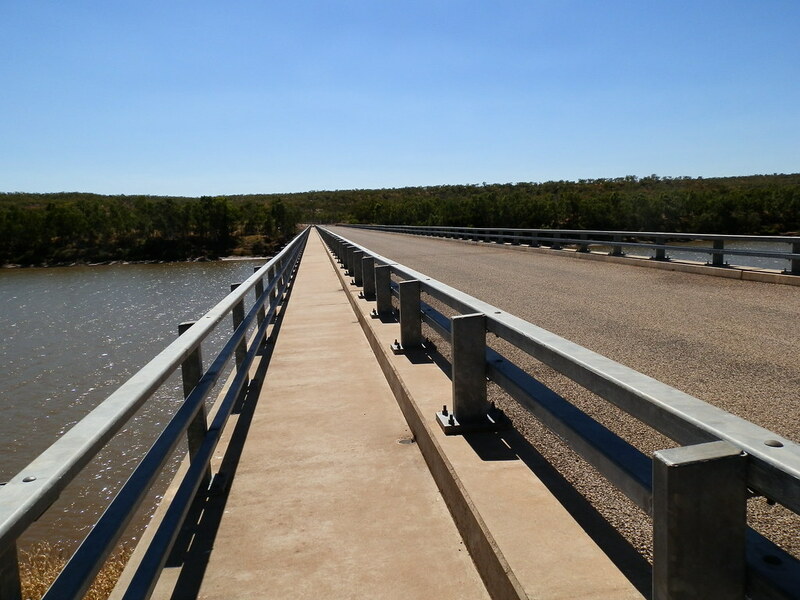 If you’ve seen the super-highway-like Bridge to Nowhere spanning the Victoria River you’re probably questioning my judgement about recommending it as a Timber Creek attraction. Especially if I say the bridge was a highlight of our visit! The bridge doesn’t REALLY go to nowhere – it just goes to nowhere the average person is allowed to go ie the Bradshaw Field Training Area. If in any doubt about entering, there’s a few handy hints that’ll make your unwelcomeness perfectly clear. Like the massive gate with padlocks and spikes. 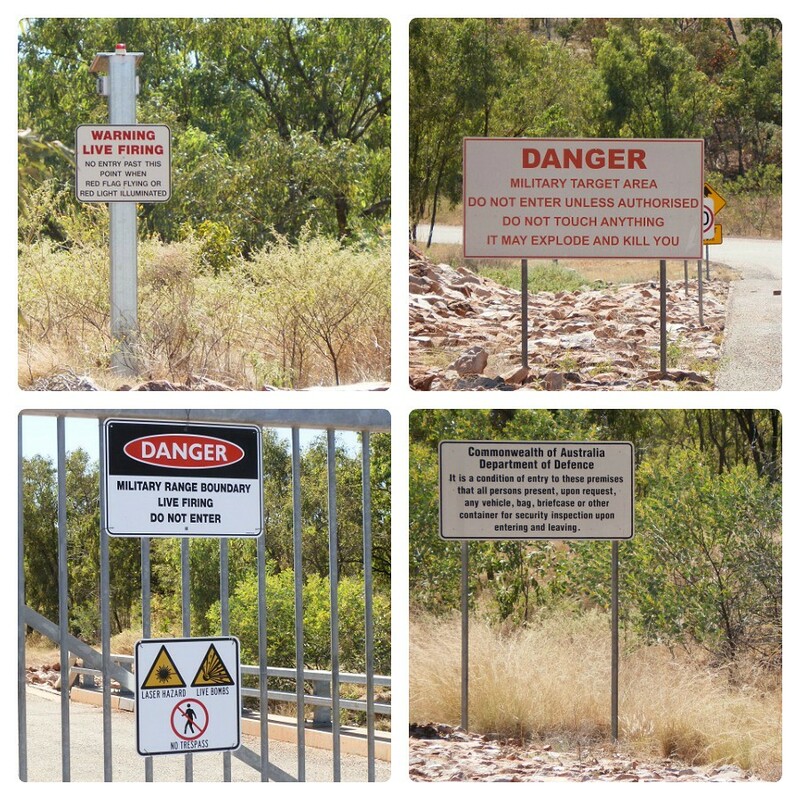 And the four separate signs with different messages that make even a croc seem friendly. But quite apart from anything else, the bridge – across which you’re quite welcome to walk – is one of the best places from which to appreciate the grandeur of the Victoria River! 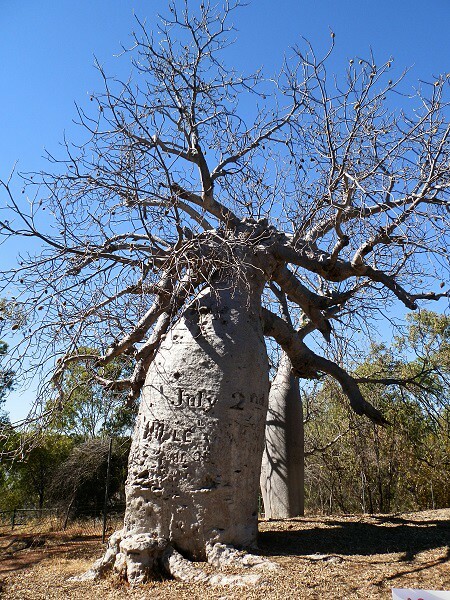 When I first saw the Gregory Tree, it was overlooking a crocodile from high on the banks of the Victoria River. 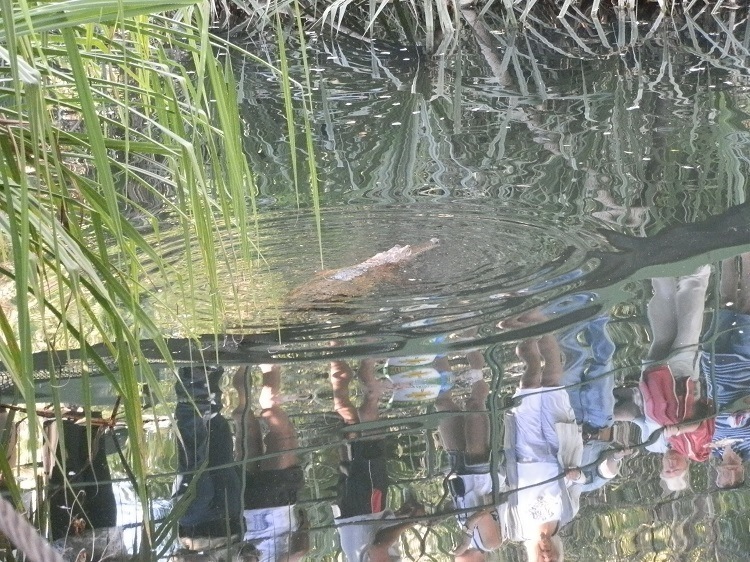 I was checking out the same crocodile from just above the waterline on the croc-proof cruiser. I’m not sure who had the best view, but there were no crocs in sight when I saw the tree up close the next day. 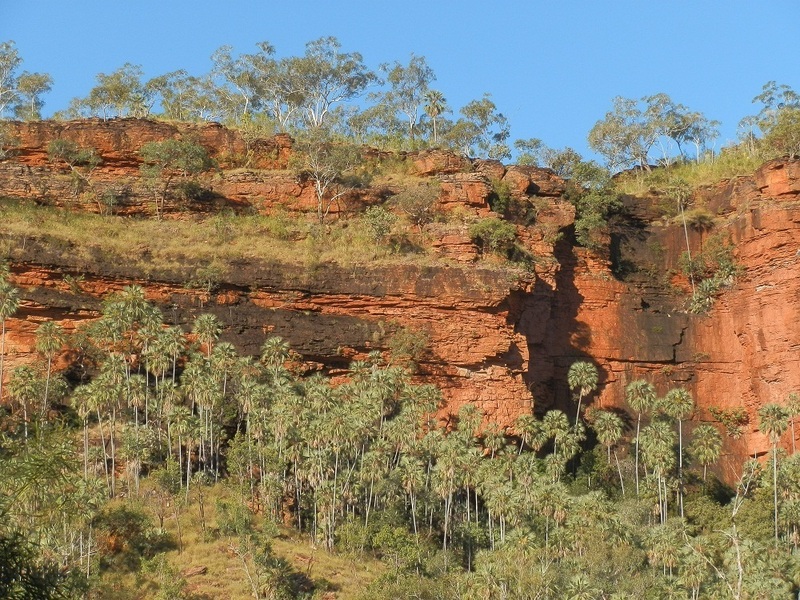 It’s just part of the 13000² km Gregory National Park, named for explorer Augustus Charles Gregory, whose expedition passed through in the mid 1800’s. And although graffitti artist Gregory left the travel dates inscribed on the tree, it’s considered ‘historic’, rather than vandalism! There’s nothing to say how the local Ngaringman Aboriginal people felt about Gregory defacing the tree – it’s also registered as a sacred site. 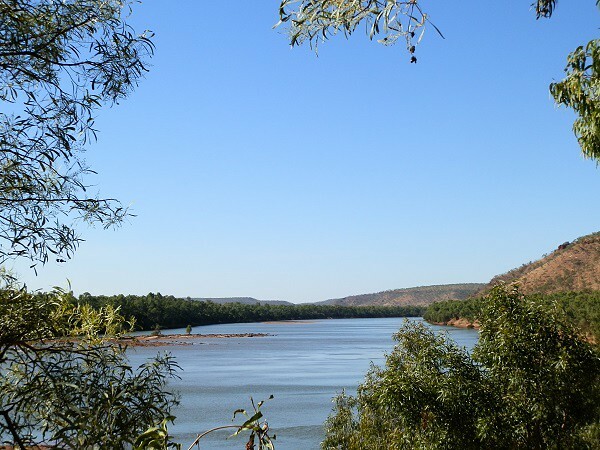 We explored the eastern section of the park the day before from the Victoria River Roadhouse, 90 km east. Don’t miss the fantastic Joe Creek walk through Livistona Palms, and the amazing view from the Escarpment Lookout. 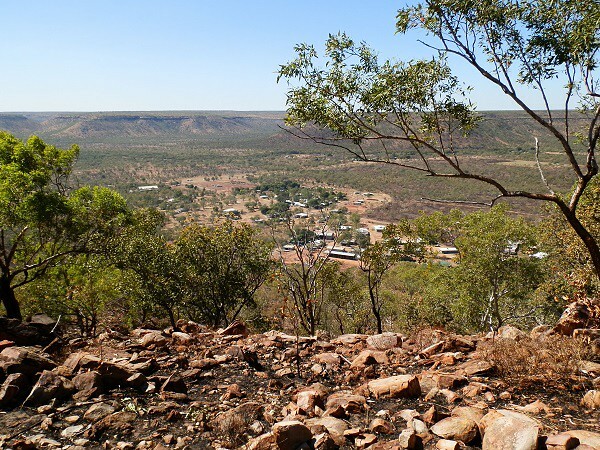 The western section extends quite a long way south of Timber Creek, with 4WD tracks to the old station homestead, gorges campgrounds and fishing spots. The tracks even join up with the Buntine Highway, an alternative route into Western Australia – which isn’t that far away from Timber Creek! Tragically, the only part of the western section I saw was the Gregory Tree – but that’s what ‘next time’ is for, right? Timber Creek may be small but has a LOT of attractions that make it a TOP Aussie Town!. So if you’re thinking of giving it a miss, think again and get there early – because sometimes acting like a grey nomad pays off! Where: Timber Creek is ~285 km west of Katherine; 90 km west of the Victoria River Roadhouse; 225 km east of Kununurra on the Victoria Highway. When to Go: Temperatures are lower with less humidity during the Dry season from June to November. 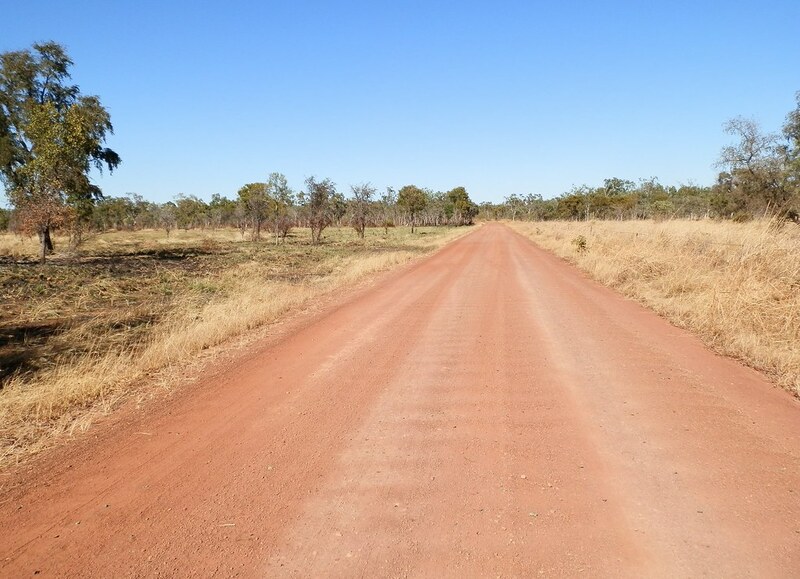 4WD tracks and other attractions are closed during the Wet Season when rains commence around December and re-open around May depending on the amount of rain. Where to Stay: We stayed at the Circle F Caravan Park attached to Fogarty’s Store and the Timber Creek Hotel, also with cabins and motel accomodation. The Big Horse campground is near the boat ramp. Gregory National Park has several campgrounds. What’s There: Timber Creek facilities include accommodation, fuel, food, banking, vehicle repairs, emergency medical services and an airstrip. Timber creek seems to personify the outdoor spirit of Australia. I am enthralled reading about the cruise on the river Victoria. The pictures are stunning, loved the one which has the white crocodile. 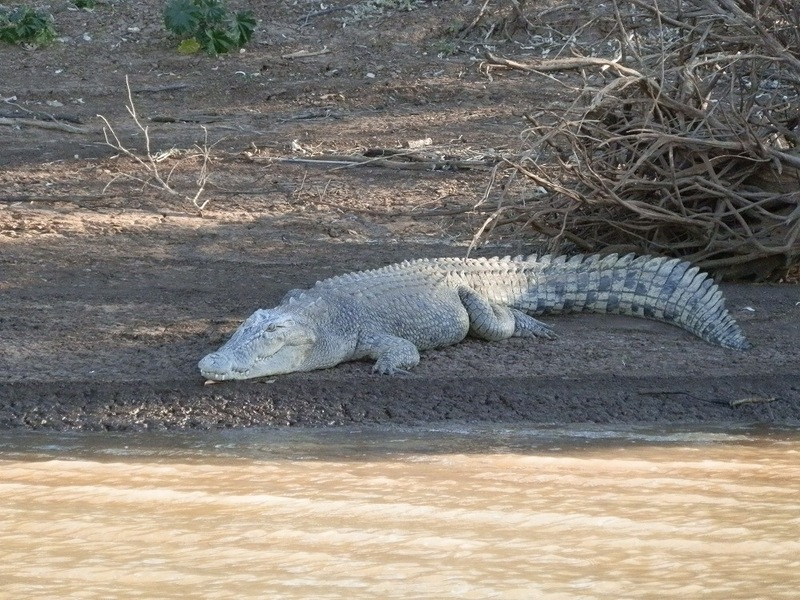 The Victoria River Cruise is what’s known as a ‘sure thing’ in the croc-spotting world, Sandy N Vyjay! This is a real outback town and you’re right about the outdoor spirit of Australia on full display here! We are at timber creek at the moment. Unfortunately the tour is no longer available. I have contacted the Timber Creek Hotel who advise that the tour is closed for the season. It normally operates May to September, but this year (2017) it closed early because of mechanical problems. Next year it will be back for the season as planned. I’m sorry you didn’t get to do it – maybe another time. As if crocodiles weren’t dangerous enough, a live firing range? Timber creek is a seriously cool place! The white crocodile still had BIG teeth, Liz! Gorgeous pictures Red, as always. it’s such a stunning land we live in. That’s a lot of crocs for sure! I like the bridge to nowhere, I always imagine such bridges lead to someone’s personal, private, hideaway home. I remember the firing range near Puckapunyal when we lived there. It was restricted only on firing days, at other times many of the soldiers took their kids there to learn how to drive. Oh, shoot. We´ve been in Katherine, in Kununarra…. and missed this gem, how could that happen?! Great photo of the white croc. It’s lovely at Timber Creek.. In MY opinion, all the four signs should have pictures. Then, they will look more friendly and welcoming than crocs at least! Haha, that’s a GREAT idea, Kozue! We Aussies are so ‘good’ at coming up with weird graphics that everyone else in the the world is supposed to understand!! Lots to take in there. You need eyes in the back of your head with that many crocs around. Another interesting feature is that bridge to nowhere with all those ‘Welcome signs’! Is it perverse of me to want to go through a gate with THAT many ‘welcome’ signs, Fun60? Not that I wanted to get shot or anything, but I DID want to see what was on the other side, even if it was a little bit OTT!! I would be very careful in croc country. Those salties didn’t get that big by missing many meals. Great story and photos of this journey. I reckon these crocs are the best fed crocs in Australia, TFG! 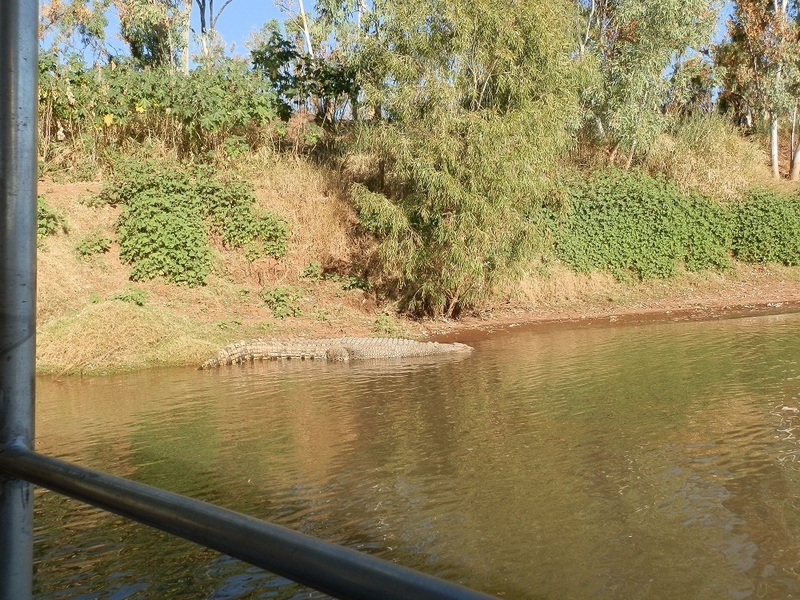 Apparently hundreds of cattle from the pastoral properties lining the river get ‘taken’ every year – I hate to think how old that 5-6 metre croc was, but he didn’t look like he’d be dying of starvation in my lifetime!! Our record is 16km, Kathy! 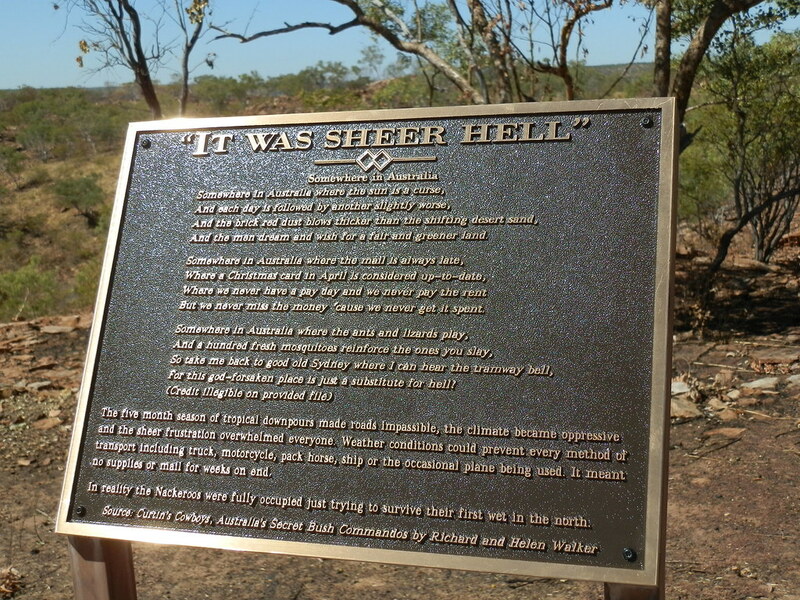 That was from Cunnamulla to Bowra Sanctuary in Outback Queensland – how embarrassing!! The stretch from Katherine to Broome took us 30 days or so, and we stayed longer than we expected to in quite a few places, but it still felt we were hurrying! And I thought you becoming a grey nomad meant you left your hair dye at home. The Victoria River looks grand. That first croc looks like it is hiding, ready to grab its prey of human. HAhahaha, the day I become a REAL grey nomad is the day I go incognito, Andrew! No one would recognise me with NON-RED hair, and quite a few companies would go out of business 😀 And the 1st croc? It probably IS lying in wait for a hapless human! !